This has been my favorite stamp set from the Summer Mini catalog and I wanted to show it off tomorrow. I love how well it pairs with Word Play! I kept it simple and didn't add any accessories. Our post office is getting really strict on cards with bumps, so this would be a great card to mail with just a regular ol' postage stamp. I took a few liberties with the sketch over at The Paper Players this week. When I looked at it, pinwheels immediately came to my mind so I went with it. It was supposed to be a clean-and-simple card, so I tried to leave it that way. Still working with Raining Flowers, but I think I'm moving to a different set tomorrow. :o) This is one of those cards that started out totally different and I'm still not sure that I like how it turned out. I'm really loving the torn frames with the bit of newsprint peeking out (Thanks, Teneale!). Look at the snow! I am from the gorgeous mountain of Kentucky, but these were so different and amazing! This was taken on the way to the Stampin' Up! home office in Riverton. What a fun trip that was; it looks like such a wonderful place to work! Here's what I'll be working on Saturday. I took a +fun class at Convention, but I didn't want to add all the elements to my little houses and risk them getting destroyed in my suitcase. I did paint them and get a few things punch and ready. I must have the distressing kit after playing around with it in class; we used it to add a little age to the houses! I was thinking about offering this as a class this fall, so let me know if you are interested! This is my other project for the weekend. I have some good friends coming over to hear all about my trip and assist me with my projects, so it should be fun. :) I didn't make this in my make-and-take session because again, I would have cried if I'd messed it up bringing it home. 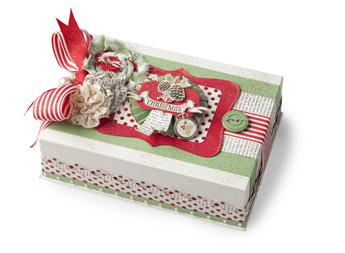 I love this and thankfully, this box will be available in the Holiday Mini so you can make one, too! This was my gift for my sweet roommate. I hope she liked them. I wrapped up the bracelet in some pretty paper and ribbon, which you'll see below. I had so many bags and I made a tag for each and every one of them. My shoulders hurt and I am happy to be home and not have to carry them around anymore. Here's me and my roommate, the amazing Jackie Topa. It was so neat to get to spend time with her and bounce around some ideas. She has challenged me to put together a tutorial for a stamp camp or class, so that's what I'll be working on for the rest of the month. 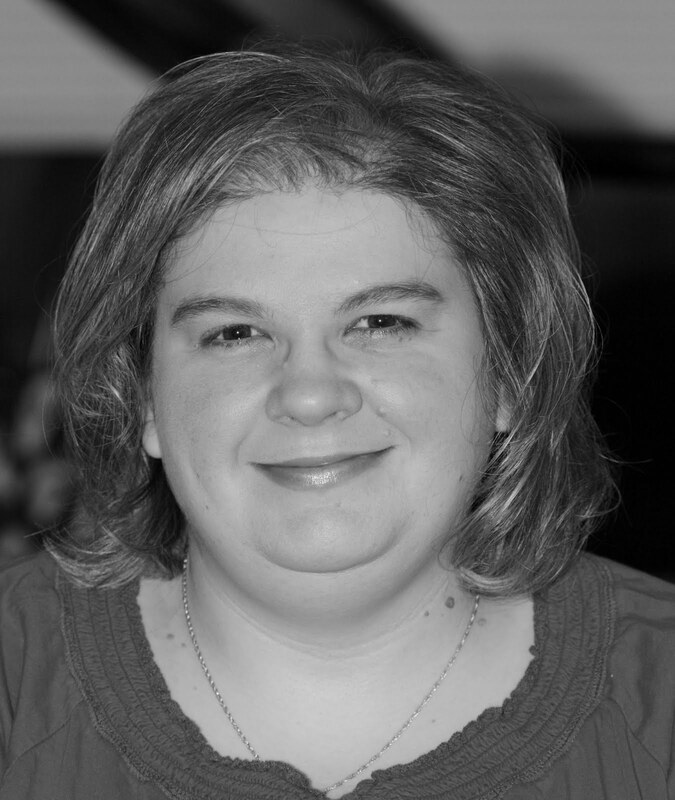 You can check out her blog here. I have tons of pictures from Convention over on my Facebook page, so be sure to go check it out if you want to see tons and tons more. While browsing the display boards, I found my swap from the regional in Ft. Worth last year! I was so excited! Finally, Jason surprised me and painted our kitchen Not Quite Navy and Baja Breeze while I was away. Isn't it gorgeous?! Now I need some Cherry Cobbler curtains, so let me know if you happen to see any! Be warned! You will be seeing a lot of this set. I haven't placed my order from the new catalog yet, so this is my only new set. I got it for free, so I love it for many reasons. :) I can already tell that it will be one of my favorite sets; I'm adding more buttons to my order-in-progress. I saw Jaydee's lovely combination of Marina Mist and Real Red and had to use them myself. What a perfect pair! Embossing is fun, but double embossing is even more fun! Ink up your embossing folder with Versamark, emboss as normal in your Big Shot, and then add your embossing powder and heat. I want to redo this one and use plain card stock and a vintage brad for my flower as I think it would look better that way. How about a different card fold? This is a pocket fold card and it is super easy to do. I decorated it with all the fun nautical items from the Summer Mini Catalog. Faux mother-of-pearl is one of my favorite new techniques. I love the aged look that it adds to a card. Erica's lovely card was the inspiration for this card. Here's a card using the fun new set, Button Buddies. Pardon the crooked image; I was just too excited to get ink on my new toy! This is one of the cards for my next techniques class. It uses one of SU's awesome clear blocks to make a background with ink. I did that, stamped inside my square and voila! How cool is that? It is a perfect technique for French Foliage, which I am so, so happy to see return! Don't adjust your television set! Yes, it is a Christmas card! Can you believe it? This week the Paper Players challenged us to make a Christmas card and because I love those ladies, I did. :) Mojo Monday has a great sketch this week, so I combined the two challenges and came up with this card. It has been ages since Season of Joy saw ink, so it was nice to get all nostalgic and use it. It was one of my first stamp sets and I still love it. Today is one of the most exciting days of the year for Stampin' Up! 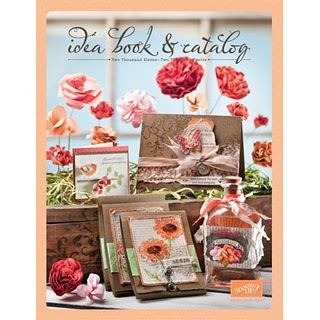 The new Idea Book & Catalog went live about an hour ago! Now you can order all the fun new stuff that just became available. There are some awesome new stamps sets and accessories that will knock your socks off! If you need a catalog, please let me know. They are $10 or free with an order of $50 or more. If you want to join in the excitement of getting to order early, this is a great time to sign up as a demonstrator! For only $99, you can get started today! You can contact me or go straight to my website and sign up. It is so fun being a demonstrator and I'd encourage anyone with a love of paper crafts to try it out. You get over $180 worth of products for that $99, plus a one-time 30% discount on your first qualifying order. To make it an even better deal, you also get a Free Christmas keepsake project kit valued at $40. CCREW0711DF, CreativeCrew, SUO or SUM -- DSP/Color Focus: Show us what you can do with the In Colors! You can use other colors, but In Colors should be the main focus of your project. CCREW0711HF, CreativeCrew, SUO or SUM -- Holiday focus: Show your national spirit! What does your country mean to you? CCREW0711SF, CreativeCrew, SUO or SUM -- Scrapbook focus: It's Family Reunion month, focus on your family! I have to admit, I am in love with Island Indigo. I have a thing for blues and it has swept in and stolen my heart away from all the other others. This is one of my favorite cards EVER!